We’re suckers for a good glimpse behind the scenes of any shoot, but this is exceptional. 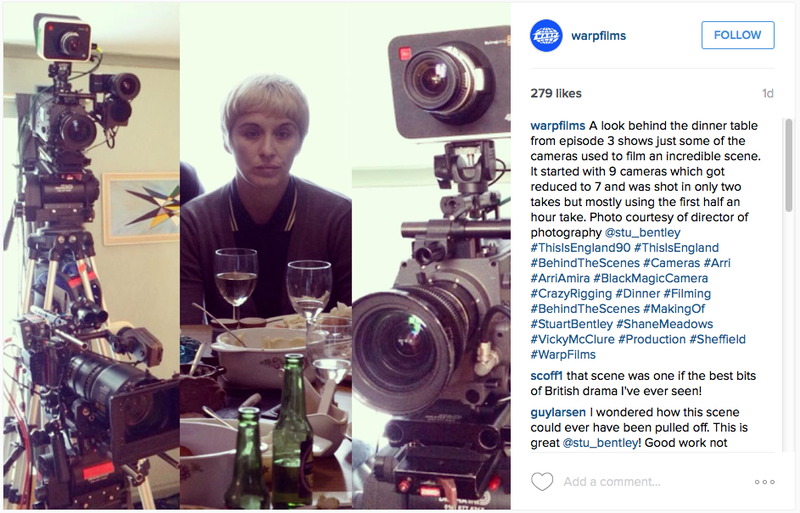 Warp Films, the production company behind the popular UK drama This Is England ’90 recently took to Instagram to show off the elaborate setup that went into a key scene in the most recent episode. The caption elaborates a little on the technical details that went into the scene, arguably one of the most intense in television history. It was shot in two takes, the first of which was half an hour long, and was originally planned to be shot with nine cameras, though this was subsequently reduced to seven. It was shot by cinematographer Stuart Bentley, and was very much in line with the naturalistic style of series creator Shane Meadows. The effort that went into capturing the scene seems to have a paid, with the drama garnering a hugely positive reaction from viewers on social media. Included in the rig we reckon we can see a Blackmagic Cinema camera and a Blackmagic Pocket Cinema camera – what else can you spot? This Is England ’90 continues with its final episode on Sunday.